Meet 'The Snoog'. We bought him from an op shop a couple of years ago for $25. Our only regret was not buying his friend (a slightly more up market edition priced at $35). Thankfully as the kids have matured they seem more capable of sharing and taking turns. Oh but how quickly things can change. Sam and I once went for a lovely country drive down The Huon. Back in the good ol days (before kids) and we had a lovely quiet lunch, went for a walk and so on... On the way back we took a different route - a mandatory requirement for any day trip with Sam behind the wheel. As we wound down a country road we came across two bulls (one black Angus and one Hereford), standing in their respective paddocks on opposite sides of the road. Pawing the ground, nostrils flares eyes practically rolling back in their heads with frustration of having two fences and a road between them. 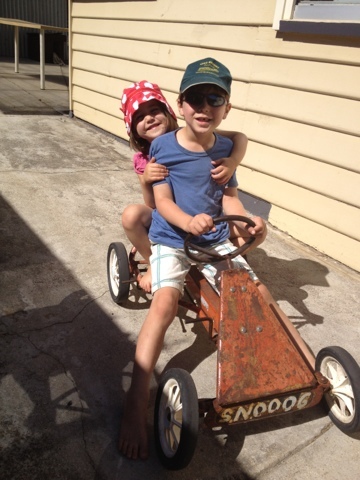 The relevance to this serene picture of two happy kids on The Snoog to the bulls? Well shortly after the photo was taken communication broke down and the children were unable to come to an agreement as to whom would pedal. It's been one of those days (and this was taken at 10am) and Mummy Bear had had ENOUGH. The children were sent to their rooms to have a think about how they might play together nicely and how they could speak to each other using their nice voices. Only, because they share a room Ingrid was sent to my room which is across the hall.